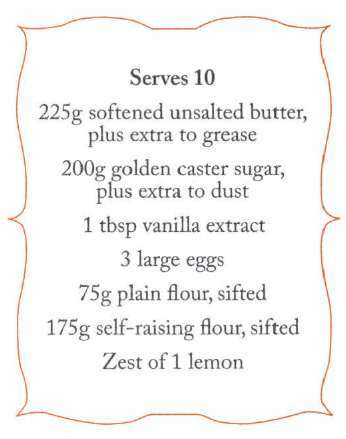 Beat together the butter, sugar and vanilla extract in a large bowl using an electric hand whisk. Gradually add the eggs, adding a spoonful of flour if the mixture looks like it is about to curdle. 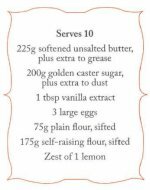 Fold in the remaining plain flour, the self-raising flour and lemon zest using a large metal spoon. Spoon into the prepared tin, sprinkle with the extra sugar and bake for 1 hour until a skewer inserted into the centre comes out clean. Cool on a wire rack and store, wrapped tightly in clingfilm, in an airtight container for up to three days.